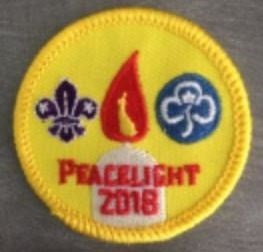 Again this year we had a "special events" badge made for the UK Peace Light - having been approved by Scout HQ, the badge may be worn on the uniform in the appropriate position between December and February with approval of the local CC/DC Details of how to order these badges and links to the order form are provided below. We also provide links to other third parties who can supply Peace Light / Messengers of Peace badges, kneckers, shirts etc. Should you be interested in any of these items, it is up to you to contact them direct and place your own orders. Of course being third parties, these companies have no connection to this site so we unable to address any problems regards payment, delivery or any disputes that may arise. World Scout Shop - hold a number of Messengers of Peace items, badges, shirts, kneckers etc. postage is additional. They also hold the World Membership "Ring" badges (see note below). Click the Icon to move to the Scout Shop website (opens in a separate window) PLEASE NOTE - the Messengers of Peace "Ring Badge" does not fit around the UK World Membership Badge, although a US one will. Please note that these ring badges are not "officially" UK uniform items.